your business makes all that difference. SAPEKSH TECHNOLOGIES PVT LTD is a rapidly growing Software Development Services Company in Pune, India. The company is founded in the year 2005. Since then we have worked hard to achieve several milestones. Our team of expert Developers have satisfactorily served a multiple range of clients till now by offering them software solutions designed to meet their specific requirements. We are here not only for client satisfaction but also to serve end users indirectly. Because finally end users are the ultimate goal of ones business. Efficient delivery, expected result based solutions, reliable professional bonding, creative and hard working team of developers are some of our company's basic structural pillars. We, at SAPEKSH focus on what the customer needs, instead of what it has to offer. We are very much happy and satisfied with BuiltUP & StockUP software. The most important impact of software to our business is that almost the entire aspect of our business activities across sites is now integrated under a common platform. 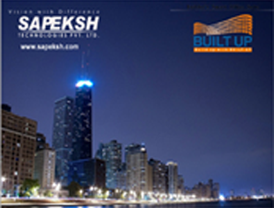 Sapeksh provides smooth integration between modules, ease of use with a superior training and implementation. I also want to thank your great software support staff. I would recommend them to anyone. Someone says Builders are the dream seller. Yes, indeed. They sell dreams in the form of homes. Now, in the age of modernization and the fast growing market every Builder badly wanted a system, a tool to manage the expanding business and to make a strong bond of trust with their customers. Here is a software named as Built UP brought to you by Sapeksh Technologies Pvt. Ltd. Built UP is a revolutionary tool with which the Builders can organize and manage everything related to their customers. It covers a major job and plays an important role in a general Builder's Office. With the help of Built UP, the Builders can keep track of the customers right from enquiry to the possession up to the aftersales management without errors and thus save time. This software makes giving quick service to the customers an easy task. With user-friendly interface it can be readily welcomed by the staff and the customers, both. This can help giving the Builder's Office a professional uplift and thus boost the business. 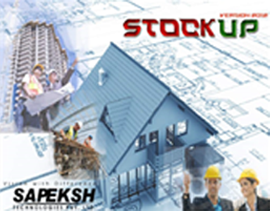 Stock UP is also a revolutionary tool with which the Builders can organize and manage everything related to their site inventory. It covers a major site managment job like Item managemnet, Requisitions (With approval system), Purchase Order, GRN, Issue etc and plays an important role in a Builder's Engineering Officce. our strong technology expertise and indepth industry knowledge to develop customized solutions and services to fit your needs. Here is what we do. business tycoons, builders, industries, hospitals, transcription companies etc. All these clients are our strength. © Sapeksh Technologies Pvt Ltd.